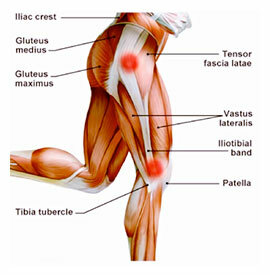 The ilio tibial band runs from the hip to the lateral side of the proximal end of the tibia. Its function is to resist internal rotation of the tibia as well as to maintain the lateral integrity of the leg. Ilio tibial band syndrome is a condition wherein the ilio tibial band is stretched and torqued and the distal end rubs across the lateral condyle of the femur. Patients complain of pain on the lateral side of the knee often extending up the lateral side of the thigh as high as the hip. Overstress of the ilio tibial band. During a normal gait cycle, the femur and the tibia rotate in unison (i.e. internally during pronation and externally during supination); however, when a person overpronates, the tibia is locked into the talus by the saddle joint and therefore continues to rotate internally past the end of the contact phase while the femur begins to externally rotate with the pelvis during midstance phase. The resulting counter rotation of the femur and the tibia causes a shearing force to occur in the ilio tibial band is torqued and stretched. 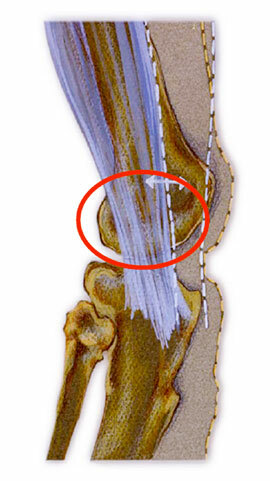 The result is that the distal end of the band rubs across and is irritated by the lateral condyle of the femur. Massage and stretching of surrounding muscles to help ease the tightness and ice to reduce inflammation. Since the problem is the abnormal pronation, the patient should be fitted with functional orthotics to correct the prolonged pronation, thereby reducing the counter rotation between the femur and the tibia, alleviating stress off of the ilio tibial band.